How to use the cards exchange tool to change a high rank poker hand when playing the texas holdem or Omaha poker game. This is cards exchanger taken to the next level. You don't need other partner to tell you the poker numbers or suits by earpiece or any poker scanning system. You can change the cards yourself alone to the numbers you need. And it can be done as a purse, and table or cuff device to exchange the normal playing cards. There are two kind of exchanging cards table in our company. 1.Cooperate with your partner, the cards can be transferred from one end to the other end quite quickly and silently. You can exchange the cards with your partner and get the cards that you want. 2.a quite small flat machine can be installed in the table and you can hide the card you want in the table before and later you can exchange the card on your hand with the hidden card. 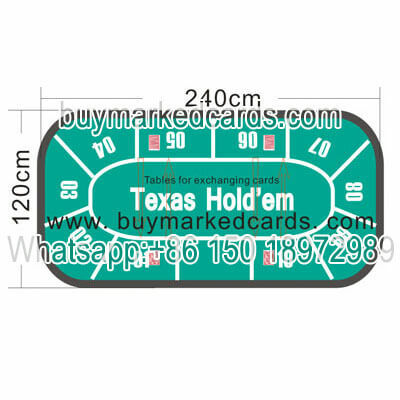 Table cards exchanging tool which can not be detected by other signal jammer device, cause there is no need any signal transmitted, you just need hide the big numbers cards and exchange the cards when you need. It is very easy to manipulate, and do not need the sunglasses with invisible marked cards.